Aquarium staff and teen interns bring free, hands-on presentations and activities into the community. Programs are built on science concepts and presented in a fun, interactive way to create local connections and build science skills. 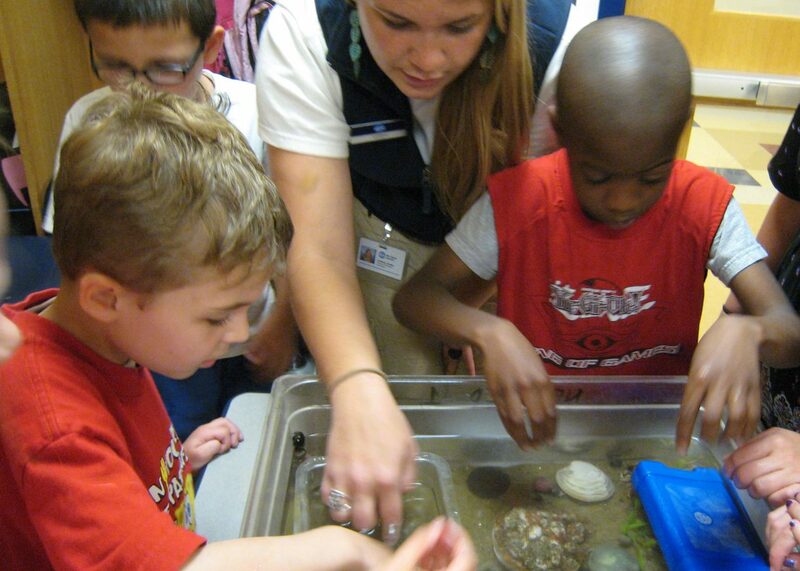 Educators encourage local children to observe, touch, and learn about marine life and ocean ecosystems. Bring STEM to life with live animals! 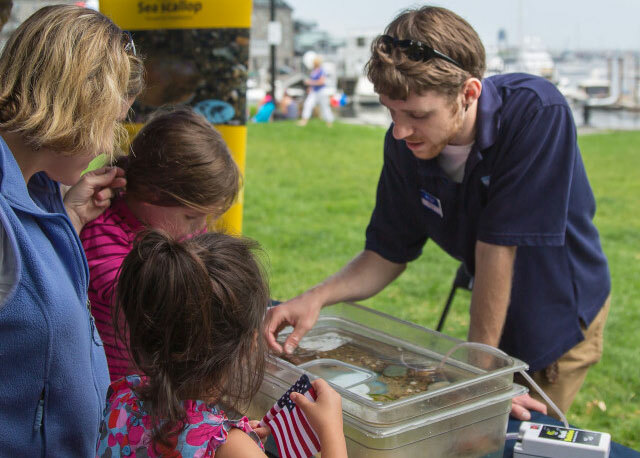 Aquarium educators and teen interns will travel to your site in July or August with live tidepool animals, crafts, and activities for youth ages 5 to 12 years old. Our youth-focused workshop encourages the use of science skills such as observations and predictions, while also highlighting the local coastal habitats and animals of Boston. This workshop is only available to youth ages 5 – 12 years old. To make the most of this STEM workshop, encourage youth to come prepared to ask a lot of questions. Read our FAQs to check eligibility. What will students do during the workshop? We will start with an introduction to different types of coastal habitats that exist in the Greater Boston area (sandy beach, rocky shore, and salt marsh). Students are able to touch the live animals that are displayed by their respective habitats. Live animals can include snails, crabs, mussels, oysters, hermit crabs, and clams. Our educators will encourage youth to closely observe the animals, by sight and touch, communicate their observations, and draw on prior knowledge to make judgements about their behavior and anatomy. The workshop is 1 hour long. What will you need to set up the workshop? We will need two large tables (preferably 6 – 8 ft. long), and access to the set up area that does not require stairs. Yes, parking is a requirement to have this workshop travel to your site. A visitor or guess pass for street parking is acceptable. When can this workshop come to my site? This workshop is available only in the summer (July and August). Availability is limited to weekdays only. What if I only have a few PreK youth, can they join the workshop? Unfortunately, this workshop is not age-appropriate or engaging for youth younger than 5 years old. How many students can participate in this workshop? We can allow up to 40 students at one time. If your group is larger than 40 youth, we can split your group into two back-to-back 30-minute workshops for each smaller group. The deadline for all Summer Youth-Focused Workshops applications is May 31. Please note that the application will not be accessible after this date, and we will be unable to accommodate your group. We bring this hands-on workshop to a variety of community events, including neighborhood block parties and STEM nights. These events should be free and open to a communitywide audience. We provide four different workshop options. Please read each description to find the workshop that best fits your event. These workshops are ONLY available for special community events. If you are looking to bring a traveling workshop to your youth group, please refer to the Summer Youth-Focused Workshops above. This traveling workshop offers a chance for youth and families to engage in STEM (Science, Technology, Engineering, and Math) learning together. Using models of a sandy beach, youth and families are challenged to test different strategies to limit the amount of erosion to the beach. We encourage groups looking to extend their STEM offerings at a special event to try out this workshop. This workshop can be successful at many types of community events, from a STEM-focused family night to a neighborhood gathering at a local park (most appropriate for youth ages 6 and older). Read our FAQs to check eligibility. What kind of events do you travel to? We bring this hands-on workshop to all kinds of community events, from a neighborhood block party to a STEM night. We think there are lots of opportunities to engage families in STEM learning. Not sure if this is the right workshop for your event, please get in touch! This is an open-ended workshop that does not include a formal introduction or wrap up. Participants are able to visit this activity and interact with the materials at their own pace. We will send Aquarium educators and teen interns to your site and set up anywhere from 3 – 4 models of our sandy coastline (containers filled with sand and water). Each container has an accompanying tool kit that youth and families will use to create a design that will slow the rate of erosion. There are many ways to approach this engineering challenge, and we encourage youth and families to experiment, build, test and redesign while thinking about how humans and animals use the beach! We can be flexible with how long we present this workshop for participants. In general we attend events with this workshop anywhere from 2 – 4 hours. We will need two large tables (preferably 6 to 8 ft. long), and access to the set up area that does not require stairs. If your event will be held outside, we would prefer to set up in a shaded area. If a shady area is not available, we are able to bring our own pop-up tent (10’ x 10’) and would need enough space to set this up. This workshop is available year round. What ages is this workshop most successful with? This workshop is most appropriate for ages 6 years old to adult. How many people can participate in this workshop? We do not have a limit to the number of people we can engage with this workshop, though we are limited to the number of people we can engage at one time. All applications for Community Event Workshops will be accepted on a rolling basis throughout the calendar year. All requests are subject to availability. What kind of community do you want to live in? Ponder that at our Dream City workshop. This interactive exhibit allows neighbors to play alongside neighbors to make changes to our model city and share their ideas for their community. Explore how our collective dream city prepares us for our changing ocean and climate. Guests will walk away with ways to engage and become more climate-ready residents. This workshop can travel to many types of community events; from farmers markets and festivals, to a neighborhood gathering in a local park! This program is most appropriate for ages 6 and older. Read our FAQs to check eligibility. This is an open-ended workshop that does not include a formal introduction or wrap up, participants are able to visit this workshop and work with the materials at their own pace. We will send Aquarium educators and teen interns to your site and set up our model city with LEGO® bricks. While guests build and contribute their aspirations for their community, our educators will be available to discuss current city efforts to adapt to the effects of climate change. We can be flexible with how long we present this workshop for participants. In general we attend events with this workshop anywhere from 2 to 4 hours. We will need two large tables (preferably 6 to 8 ft. long), and access to the set up area that does not require stairs. If your event will be held outside, we would prefer to set up in a shaded area. If one is not available, we are able to bring our own pop-up tent (10’ x 10’) and would need enough space to set this up. 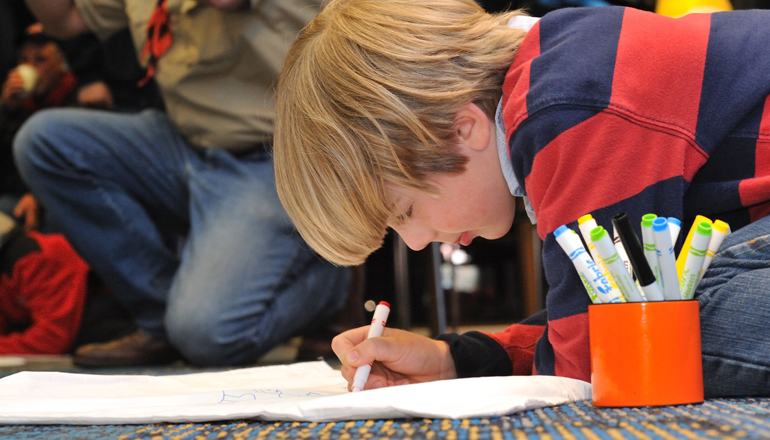 This workshop is most appropriate for ages 6 and older. Connect your community to the coast! This activity is designed to introduce local marine animals to your guests. Our Aquarium educators will set up tanks of live local tidepool animals for youth and adults to see, touch, and ask lots of questions about. These animals can be found along many of our local beaches, so come learn how to spot them on your next day at the beach. This workshop is appropriate for all ages. Read our FAQs to check eligibility. This is an open-ended workshop that does not include a formal introduction or wrap up, participants are able to visit the tanks of live tidepool animals at their own pace. We will send Aquarium educators and teen interns to your site and set up three to four tanks with live tidepool animals. We can be flexible with how long we present this workshop for participants, with animal safety in mind. In general we attend events with this workshop anywhere from 2 to 4 hours. This workshop is appropriate for all ages. 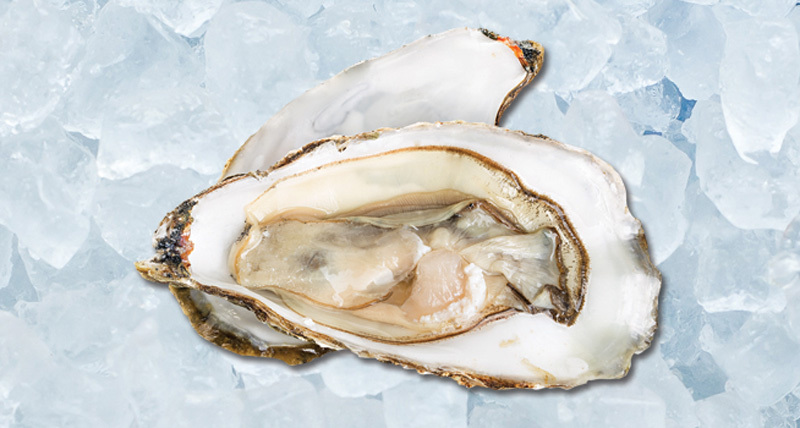 Here’s more information about one of our best local seafood choices: farmed oysters! How does our seafood get from the ocean to your plate? Aquarium educators and teen interns will set up three or four tanks of live, local marine animals for youth and adults to see and touch. Learn more about how these animals fit into the local ocean ecosystem, how we farm and fish for them, and what seafood choices are the most ocean-friendly. This workshop is perfect for food festivals, farmers markets, and other community events! Great for all ages: the youngest scientists can get their hands wet while grown-ups learn how to make more informed decisions about their seafood! Read our FAQs to check eligibility. This is an open-ended workshop that does not include a formal introduction or wrap up, participants are able to visit the tanks of live tidepool animals at their own pace. We will send Aquarium educators and teen interns to your site and set up three or four tanks with live tidepool animals as well as signage about local seafood. Guests are invited to touch and observe animals as well as talk to our educators about New England seafood and fisheries. We can be flexible with how long we present this workshop for participants, however animal safety is a priority. In general, we attend events with this workshop anywhere from 2 to 4 hours. 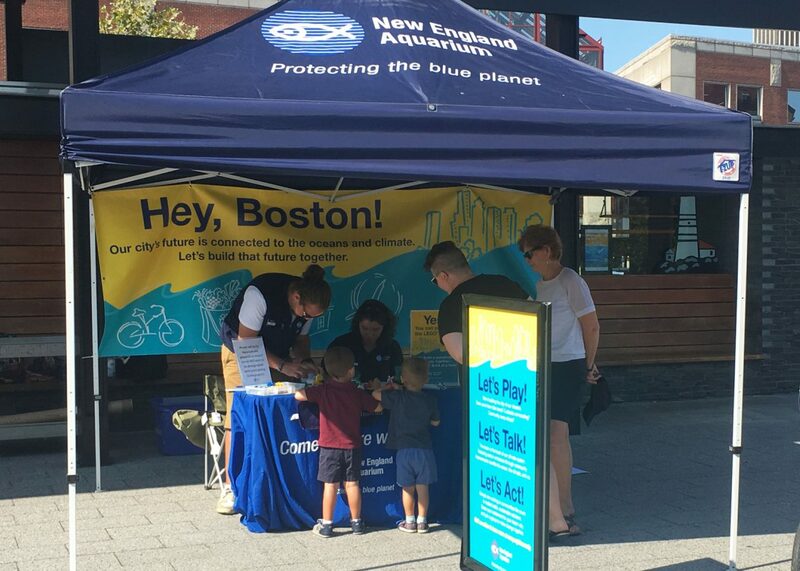 Contact Community Programs at 617-973-0281 or communityprograms@neaq.org.